The UNTWO’s “Tourism Highlights 2016 Edition” lists the top ten tourism-receiving nations by international tourist arrivals (how many tourists from other countries visited), and by international tourism receipts (how much money tourists from other countries spent). France was the #1 country by international tourist arrivals. In 2015, France was visited by 84.5 million visitors. In second place was the United States, receiving 77.5 million visitors. In third place was Spain, receiving 68.2 international visitors, followed by China at #4 with 56.9 million visitors. Italy was #5 with 50.7 million visitors, followed by Turkey at #6 with 39.5 million visitors, Germany at #7 with 35 million visitors, and the United Kingdom in 8th place with 34.4 million international visitors. Mexico was #9, meaning it had more international visitors than every country in the world with the exception of the top 8 just mentioned. 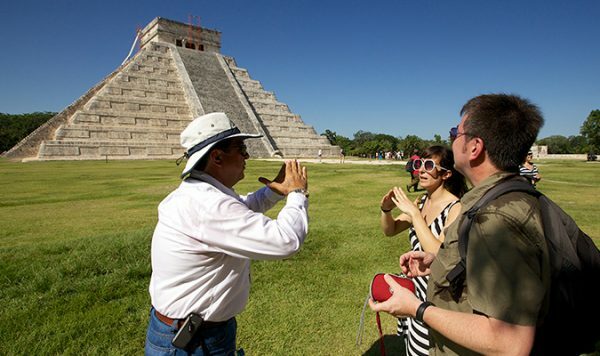 Mexico’s steady increase in tourist arrivals is impressive when you think of all the bad publicity the country has had in the same time period, what with all the narco violence going on. Rounding out the UNWTO’s top ten list of tourist arrivals was Russia at #10 with 31.3 million international visitors. As for the top ten list calculated by tourist receipts, that was headed up by the United States, which received US$204.5 billion in tourism revenues in 2015. In second place was China with US$114.1 billion in tourism revenues. Spain was in third place, receiving US$56.5 billion in tourist receipts, followed by France at #4 receiving US$45.9 billion, and the United Kingdom at #5 with US$45.5 billion dollars in tourism revenue. The southeast Asian nation of Thailand was in sixth place with revenues of US$44.6 billion. Italy was in seventh place with US$39.4 billion, followed by Germany in 8th place with US$36.9 billion. Hong Kong was #9 with US$36.2 billion dollars in tourism revenue, and Macao (also spelled Macau) was in 10th place, receiving US$31.3 billion dollars in tourist receipts. The UNWTO has another top ten list, of the highest-spending countries in tourism. That is, the top ten countries by the amount of money some of their citizens spent in visiting other countries. In that list, China was in 1st place with Chinese tourists spending US$292.2 billion in countries other than China. The United States was #2, with American tourists spending US$112.9 billion in countries other than the U.S.A. In third place was Germany, as its citizens traveling outside of Germany spent US$77.5 billion dollars. After that was the United Kingdom at #4, its tourists spending US$63.3 billion. France was at #5, its citizens spending US$38.4 billion outside of France. Russia was in sixth place, with Russian tourists spending US$34.9 billion dollars, followed by Canada in seventh place, with US$29.4 billion. South Korea was in eight place, its citizens spending US$25 billion, followed by Italy at #9, spending US$24.4 billion. Australia was in tenth place, with Australian tourists spending US$23.5 billion in countries other than Australia. To see the UNWTO document click here. Allan Wall, an educator, resided in Mexico for many years. His website is located athttp://www.allanwall.info.